Let us pray. Kindle in our reins and our heart, O Lord, the fire of the Holy Ghost, that we may serve thee with a chaste body and please thee with a pure heart. Through Christ our Lord. Amen. The second track along which I developed this retreat will address the piety of the diocesan priest, the pietas sacerdotalis, in the light of this question: «What does the Church offer?» Piety, of course, is a word long out of fashion, at least in some circles. It is a pity that one no longer dare speak of piety. The word has a magnificent pedigree, not only in the Latin of ancient Rome, but also in the Latin of the Vulgate, and of the Fathers, and of the sacred liturgy. In February 2014, Father Hunwicke posted on Mutual Enrichment a brilliant article on pietas in which, with his customary philological erudition, he demonstrated that while pietas generally suggests a humble human attitude of devout religious attention to God, it can also refer to God’s loving attitude towards us. In more than one Collect of the Roman Rite, pietas is used precisely in this sense. For the Romans, pietas was not only the dutiful and affectionate devotion of a child for his father; the word also signified the dutiful and affectionate devotion of a father for his child. There ancient Roman monumental inscriptions that commemorate a father’s pietas. When a father is totally devoted to the welfare of his child, that paternal devotedness is pietas. One might say that when a father says to his child, «There is nothing I would not do for you», he is expressing pietas. The word evokes something that is at once strong and tender, something utterly reliable, the source of one’s security, the anchor of one’s hope. One can depend on the pietas of one’s father. My own father, for example, at 88 years of age, is still the rock of my life, always dependable. Fathers — like traditional Benedictine abbots — do not retire from fatherhood. They continue, even in great old age, to radiate pietas. At the heart of the Gospel is, I think, the revelation of the pietas of God toward us. Saint Paul writes to Timothy: Et manifeste magnum est pietatis sacramentum, «And evidently great is the mystery of godliness, which was manifested in the flesh» (1 Timothy 3:16). The pietas of the Father is revealed in the Son. What is the Passion of Christ, what is his death upon the Cross, what is his pierced Heart if not the pietas of the Father lifted high and laid bare for all to see? There is in the National Museum of Warsaw a magnificent 15th century painting from Gdansk entitled the Pietas Patris. The painting, the central panel of a triptych, now separated from its wings, depicts the Eternal Father holding in His arms the immolated Body of the Son. Hovering between the face of the Father and the face of the Son is the Holy Ghost in the form of a dove. Adoring angels enclose the Three Divine Persons in a rich drapery suggestive of the veil of a tabernacle. The whole painting exudes the tenderness and strength of the Father. The Son is held, to use one of Blessed Columba Marmion’s favourite expressions, in sinu Patris. The pietas of the Father envelops the Head and the Body of the Son. The painting makes visible the magnum pietatis sacramentum: the Father holding the totus Christus, the whole Christ, Head and Members, in the embrace of his pietas. Ant. O magnum pietátis opus: * mors mortua tunc est, in ligno quando mortua Vita fuit, allelúia. Ant. O what a work of love was that * when Life and death died together upon the Tree, alleluia. The pietas of God the Father calls forth the pietas of the beloved Son, and of all who are, as Blessed Abbot Marmion so often says, «sons in the Son». We begin to see, a descending and an ascending movement of pietas that corresponds to the priestly mediation of Christ described in article 7 of Sacrosanctum Concilium. The pietas of the Father descends to men through the mediating priesthood of the Son and in the gift of the Holy Ghost, healing the effects of sin, conferring grace and, thereby, raising men to the dignity of Divine Adoption. The pietas of God’s family of sons by adoption ascends to the Father through the same mediating priesthood of the Son and by the grace of the Holy Ghost, glorifying the Father. This descending and ascending exchange of pietas is the fulfilment in the Mystical Body of Christ, the Church, of what the Eternal High Priest prayed on the night before he suffered: «Father, the hour is come, glorify thy Son, that thy Son may glorify thee» (John 17:1). In the light of this, one can, I think, better understand, what Saint Paul wrote to Timothy: Exerce autem teipsum ad pietatem, «Exercise thyself unto godliness» (1 Timothy 4:7). Concretely, what expression might we give to our filial and sacerdotal pietas? I have given you the example of Blessed Columba Marmion’s pietas sacerdotalis, but I do not want to close this retreat without proposing to you something in the way of a rule of life based on what the Church offers, and on what the Church expects of us. On 3 May 2009, at the Ordination to the Priesthood of nineteen deacons in Saint Peter’s Basilica, Pope Benedict XVI gave a momentous teaching on prayer in the life of the priest. In my own service to priests, I find that a recurring question is how best a priest can go about praying . . . praying in such a way that his life is prayer, and that prayer is his life. This is precisely the question that the blessed Pope Benedict addressed six years ago. My own comments follow each section. Here I would like to touch upon a point that is particularly close to my heart: prayer and its link to service. We saw that to be ordained priests means to enter, in a sacramental and existential way into the prayer of Christ for “His own.” Out of this, for us priests, flows a particular vocation to prayer, in a strongly Christocentric sense: we are called, that is, to “abide” in Christ — as the Evangelist John loved to repeat (cf. John 1, 35-39; 15, 4-10) — and this is realized especially in prayer. Our ministry is totally bound up with this “abiding”, which equals praying, and from this derives its efficacy. There is an extraordinary density in this excerpt. First of all, Pope Benedict XVI confesses that the relationship of prayer to service (diakonìa) is particularly close to his own heart. Then, like the Johannine eagle, he rises to the heights of the mystery of priestly prayer; it is nothing other than an ongoing entrance — or «passing into» — the prayer of Christ for His own, for all whom the Father has given Him. «I came», He says, «that they may have life, and have it abundantly» (John 10:10). Pope Benedict XVI then affirms that priests have a particular vocation to prayer. «Just a moment», I can hear some of you saying, «I thought that monks (like Blessed Abbot Marmion) had a particular vocation to prayer. I was told in seminary that my vocation is to ministry». A tired old slogan, this! Throughout his pontificate, Pope Benedict sought to close the artificial gap between what people perceive to be monastic spirituality and what people perceive to be ministerial spirituality. (I do loathe that word «spirituality». It has, over the past fifty years, come to be charged with unpleasant connotations.) 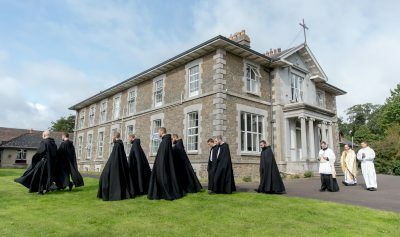 The facile affirmation, «We are not monks» has been used, in many ecclesiastical quarters, to justify a febrile activism, the very thing condemned in 1899 by Pope Leo XIII in Testem Benevolentiae Nostrae, the encyclical condemning Americanism. (I shouldn’t imagine that there would be any Americanists lurking among the English clergy, but one never knows.) The Curé of Ars was not a parish priest, not a monk — he was the quintessential parish priest — and yet his life surpassed in prayer and in austerity that of the most observant monks in their cloisters. Blessed Columba Marmion was a monk, not a parish priest — and yet his zeal for preaching and his missionary impulse surpassed, both in measure and in intensity, the labour of a many a secular priest sent to spend himself in the vineyard. Verbum supernum prodiens, / Nec Patris linquens dexteram, Ad opus suum exiens, / Venit ad vitæ vesperam. The heavenly Word proceeding forth, / Yet leaving not his Father’s right side, And going to His work on Earth, / Has reached at length life’s eventide. Just as Christ, on His mission of salvation, came into this world from the bosom of his Father, without leaving the Father’s side, so too does the priest go forth on his mission from the Side of Christ, and without leaving the Side of Christ or, if you will, the tabernacle of the pietas Patris, the Most Sacred Heart. The priest is called to «abide» in ceaseless prayer, to go forth enveloped in prayer and to bring the sweet fragrance of his prayer wherever he goes. «But thanks be to God», says the Apostle, «who in Christ always leads us in triumph, and through us spreads the fragrance of the knowledge of Him everywhere. For we are the aroma of Christ to God among those who are being saved and among those who are perishing» (2 Corinthians 2, 14-15). In such a perspective we must think of the various forms of the prayer of a priest, first of all daily Holy Mass. The Eucharistic celebration is the greatest and highest act of prayer, and constitutes the center and wellspring from which all the forms receive their «lifeblood»: the Liturgy of the Hours, Eucharistic adoration, lectio divina, the Holy Rosary, and meditation. All these expressions of prayer have their centre in the Eucharist, and together bring about in the day of the priest and in all his life the fulfillment of the word of Jesus: «I am the good shepherd, I know My own and My own know Me, as the Father knows Me and I know the Father; and I lay down My life for the sheep» (John 10, 14-15). Concretely, how does a priest solicited on all sides by the manifold demands of parochial life, un homme mangé as Blessed Antoine Chevrier used to say, go about abiding in Christ, remaining in His Heart, just as He abides in the bosom of the Father? By persevering in prayer. «Pray constantly», says Saint Paul (1 Thessalonians 5,17). Pope Benedict XVI presented priests with a Rule of Prayer: note well that this represents the daily minimum requirement. If one is habitually too busy to do this, one is simply too busy. If one is habitually too tired to do this, one is simply too tired. If one habitually has no interest in doing this, one’s priestly vocation is in danger and one is cheating one’s people of that distinctive and unmistakable «fragrance of Christ» that only a priest who prays always can spread. What might Father Everypriest’s daily Rule of Prayer, according to Pope Benedict XVI, look like? I shall attempt to present some of the elements of this Rule of Prayer in the order in which Pope Benedict himself so persuasively presented them six years ago. Daily. Not 6 days week, not 5, nor 4 days a week, but daily. The liturgical cycle that was Blessed Columba Marmion’s great discovery at Maredsous, in its hourly, daily, weekly, and yearly rhythms is given us precisely to facilitate our «abiding» with Christ in sinu Patris hour by hour, day by day, week by week, and year after year. Integral to the liturgical cycle is daily Holy Mass. The Holy Sacrifice of the Mass sends the divine lifeblood coursing through one’s spiritual organism. Without daily Mass, the priest will succumb to spiritual anemia. Why has the daily offering of the Holy Sacrifice of the Mass fallen out of favour among some priests? I can identify at least three reasons: one practical, one rubrical, and one theological. At the practical level, the reason put forward for not celebrating daily is linked to the penury of priests, giving rise, not infrequently, to the obligation to binate or trinate on Sunday. Good priests, devout priests have told me of the physical and mental exhaustion that overwhelms them after offering multiple Sunday Masses, quite apart from the other normal sacramental ministrations that are part of parish life. Some priests, reasoning rather mathematically, think, «There are seven days in the week. It is not normal that I should have to celebrate more than seven Masses. Therefore, if I have celebrated five Masses over Saturday and Sunday, I need only celebrate two Masses during the week». This kind of mathematical thinking is, alas, promoted in certain seminaries and holds sway even among some younger clergy. I suspect that the issue is related to the fact that we have, to a great extent, lost our appreciation for the quiet, restful Low Mass that, not all that long ago, would have been typical on weekdays in most parishes. The Low Mass, I think, needs to be rehabilitated and recovered as a form of Holy Mass well–suited to certain weekdays. The notion that one has to celebrate every day versus populum, singing, preaching, giving out Bidding Prayers, and exploiting all the options of the Missal, is exhausting. One should allow oneself, at least from time to time, to be a simple «massing priest», and this, without feeling guilty about it. The second reason why the daily offering of Holy Mass seems to be on the wane is, I think, rubrical. It has to do with the perceived obligation to celebrate semper et ubique versus populum. The reformed Roman Missal, of course, in its current edition, assumes that, during the Offertory and the Canon, the priest and congregation are facing in the same direction, but this rubric is roundly ignored and, in most places, remains a dead letter. The problem is, however, that the habitual offering of the Holy Sacrifice versus populum begins, almost imperceptibly, to change one’s understanding of the Mass. Lex orandi, lex credendi. What one does in church, and the way one does it, shapes what one believes. One’s identity as a «sacrificing priest», a «massing priest», gives way, over time, to another identity, that of the provider of spiritual commodities to a body of consumers. One feels that one needs to sell one’s goods, to make them attractive, to serve them up in a way that the majority of consumers will find palatable. The resurrection, little by little, of the ad orientem rubric in the current reformed Missal will, I think, go a long way to helping priests understand that the Holy Sacrifice is always offered to God, be there five hundred people in the nave, or five people, or no one at all. «The Mass», wrote Saint John Fisher, «is the spiritual sun which rises every day to spread its light and heat to all souls». The third reason why the daily offering of Holy Mass is no longer seen as an indispensable element of priestly life is theological. Due, I think, to an inadequate grasp of the reality of the invisible fruits of the Holy Sacrifice, some priests are tempted to measure the value of a given Mass by the immediate, tangible effects produced, or not produced, among the people. I find it distressing when good souls say, «Father, that was a lovely Mass», leaving one wondering about what an «unlovely Mass» would look like. It is helpful, I think, to review one’s theology of the fruits of the Mass. At Mass the priest is united with Jesus; through Him, he approaches very close to the majesty of God and is, as it were, enveloped in the divine charity. . . . Grace visits his soul and abounds in him. Whatever our miseries, our weaknesses and our past may be, we must always have before our mind the declaration of the Council [of Trent]: «Rendered favourable by this oblation, the Lord, while bestowing His grace and the gift of repentance, grants pardon also for crimes and sins, however grave» (Sess. xxii, cap. 2). The Holy Sacrifice of the Mass, offered day after day, and hour after hour, sets in motion immense waves of return to God, by obtaining for sinners graces of contrition and repentance. To offer the Holy Sacrifice of the Mass is the greatest act of mercy a priest can perform for the souls in his care, especially for those souls who, living within the boundaries of his parish, are alienated from God and from the Church, or hardened in sin, are trapped in webs of ignorance and vice. At the same time, to offer the Holy Sacrifice of the Mass is to send cascades of refreshment into purgatory, winning the eternal gratitude of forgotten souls. This last point is especially pertinent today when fewer and fewer families attend to the souls of their dear departed ones. The parish priest is the principal intercessor for his people. At no time and in no place is a priest more the shepherd of his flock than when he represents it before the altar, bringing to God the crippled, the wounded, the sick, and the lame, pleading the Blood of Christ on behalf of those of his flock who do not believe, who have lost hope, and who have grown coldhearted for want of charity. Holy Mass is the great intercession, whether it be attended by people or not. There is something grandiose about the priest who goes to the altar invisibly, but really, burdened with the weight of intentions entrusted to him, the secrets confided to him, the anxiety of the elderly, the sufferings of the sick, the vulnerability of children, the darkness of the confused, the grief of the bereaved, and the loneliness of the forgotten. Finally, there is the matter of the fruits of the sacrifice. These are generally understood to be apportioned, firstly, to the celebrant himself; secondly, to the ministers and server who assist the priest at the altar; thirdly, to the faithful in attendance; fifthly, to the beneficiaries of the priest’s particular intention; and lastly, to the whole Church, to the living and to the dead. The fruit of the Holy Sacrifice reserved for the celebrant is a special inalienable communication of grace by which he is more perfectly configured to Christ in whose place he stands before the altar. One might say that each Holy Mass makes the priest more a priest. One who offers the Holy Sacrifice daily in persona Christi captitis will find himself, almost imperceptibly, becoming more Christ–like. His face held in the gaze of the Father becomes more and more clearly the countenance of the Beloved Son; his voice resounds in the ear of the Father as the voice of the Beloved Son; in his hands, raised aloft in prayer, the Father sees, like blazing rubies, the glorious wounds of the Beloved Son. If, on the one hand, the indelible character of priestly ordination cannot be erased, it can, on the other hand, be perfected, becoming ever more radiant in the sight of God and of his Angels, and this perfecting of the priestly character in the soul is the special fruit of the Holy Sacrifice reserved for the priest. The ministers assisting the priest, particular those most closely involved in the sacred action, receive a grace proportionate to their cooperation with the priest at the altar. It would seem that among the special graces reserved to those who serve at the altar is that of a priestly vocation. How many such graces are lost today because those serving in the sanctuary, with the best intentions, have not the idoneity to receive them? Apart from the efficacious propitiation and impetration that arise from the Holy Sacrifice ex opere operato — by the very doing of the deed — there are graces drawn down upon the faithful by the piety, reverence, and care with which the priest goes about his service at the altar. This is a compelling incentive to offer each Holy Mass devoutly, attending to the words, and performing the prescribed gestures with dignity. The «ministerial» fruit goes to the person or persons, living or deceased, for whom the priest has been asked to offer the Holy Sacrifice. Masses offered in this way, at the request of the faithful, obtain signal graces: the solace and deliverance of souls in purgatory, the healing of the sick, the conversion of hardened sinners, reconciliation within families, deliverance from vice, and even material help in time of need. The universal fruit is for the benefit of the whole Church militant and of the Church suffering. The priest, bending over the host held in his hands, and breathing the words of consecration over the chalice, is changing the face of the earth and filling the heavens with wonder. The world cannot afford to be deprived of a single Mass, not today, nor tomorrow. For any one of us, tomorrow may be too late.